Arkle is a large and distinctive mountain that features in many classic shots and calendars. Although Arkle dominates the skyline from the main Scourie to Durness road this classic view is only seen if you venture a few miles down the A838 road towards Lairg. The large band of quartzite tilted at a slight angle viewed across Loch Stack gives an unmistakable profile. The slopes to the mountain are clearly steep and covered by shattered rock; Poucher comments that the moutain is known as 'slag heap' and thereby not worthy of attention. Andrew nicknamed the mountain 'Ankle Breaker' after the extensive loose rock and vowed he was in no hurry to return. However what is hidden from the roadside view is the extensive curved ridge extending for one and half kilometres and enclosing a much steeper sided corrie on the eastern side. 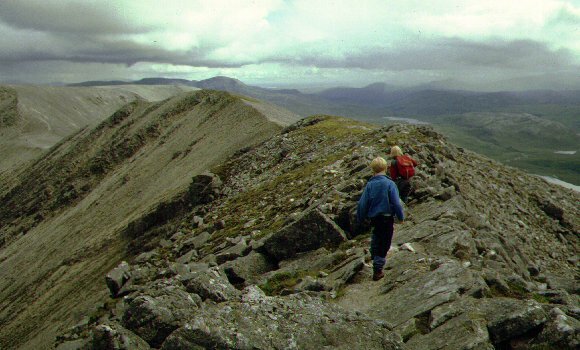 The southern ridge of the mountain swings round eastwards to join the southern extremities of Foinaven, making a very long and rough connection between these two classics of the north. The easiest approach is from the roadside and gaining the foot of the quartzite band above the hut of Lone. From there it is a long 2 kilometre climb to the southerly top at 757 m. Once the first summit has been gained the grandeur of the eastern side is revealed with a fine high, curving and narrowing ridge swinging around to the higher northern top. It is a traverse that rewards the long and rough climb up the loose rock. For descent we retraced our steps however the guide books suggest a descent can be made by continuing along the north east ridge for half a mile, then dropping in a northerly direction over Sail Mhor to pick up the stalkers path that is clearly visible swinging around the north of the mountain. The first part of this descent is exceedingly steep and will be somewhat bone shattering if the easier southerly slopes are anything to go by. This route out will return to the north end of Loch Stack, nearly 5 kilometres from the start of the ascent route. We parked the car by the track that leaves the A838 at the south end of Loch Stack. The children took their bikes to ride the track as far as the hut of Lone, leaving them where the path passes between the two halves of a giant split boulder. Beyond the path is clear and passes through some trees as it starts to climb steeply to gain the shoulder above. Here we left the path and headed north up the southern ridge, a 2 kilometre climb of more than 500m over broken rock - very tough going. 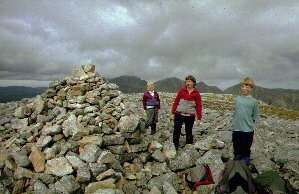 We lunched by the large stone cairn on the southern top with the narrow ridge curving around the steep corrie of Am Bathaich. The weather was bright with most tops clear for periods - Foinaven kept clouding over and clearing. 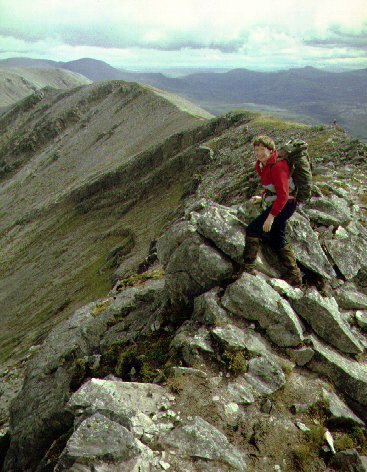 Beyond the ridge gives an exhilarating high level walk; it includes a couple of ascents over outcrops and then narrows considerably - at one point large boulders have been split leaving deep cracks, some large enough to fall into. 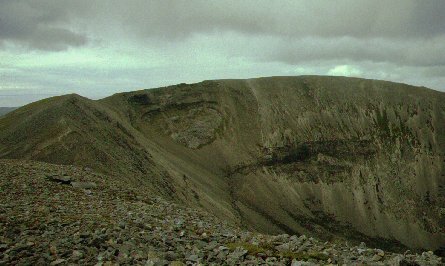 The summit is marked by a large cairn and gives extensive views of Foinaven to the north and east, and an array of lochans far below. The only person we met during the day was a man travelling south having traversed Foinaven, and then climbed the steep slopes of Arkle. It is a long return over the unrelenting shattered rock and it was late afternoon by the time we got off the slopes onto softer ground. The wind had dropped to nothing and the midges were out in force - in the time it took to unlock the bikes they collected in their hoards and were unbearable. The children rode off at speed and by the time we got back to the car we found the bikes strewn on the track and both of them firmly shut in the car. It was a lesson that effective defences against the midges must be carried at this time of year in the Highlands. 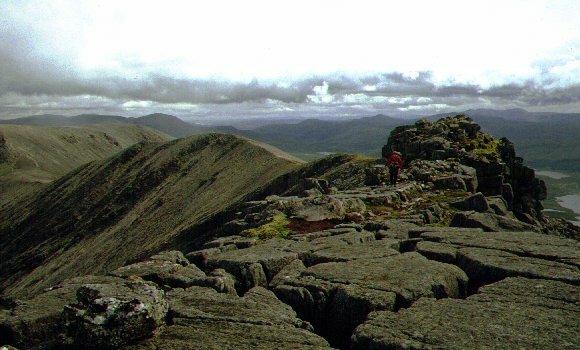 The Big Walks starts off with a chapter that recounts a traverse of both Foinaven and Arkle.